Our return policy requires a 30% restocking fee once product has been returned. Shipping of the product back must be prepaid. Product must be in original packaging and NOT USED. We do not take returns on used product. Once we receive the product back we will test to make sure it is working properly at which point a credit will be issued less the restocking fee. If product is found to be defective a full credit for the product will be issued. All components are guaranteed 30 days from receipt of product. The bad part must be returned for product replacement. PartsforSigns.com will ship replacement part for freight charges. PartsforSigns.com will not be responsible for any freight on warranty parts. Defective product must be returned to PartsforSigns.com within 7 days of receiving an authorized return number from customer service department. Technical information, recommendations and suggestions are offered in good faith and based on information we believe to be reliable. However, conditions and methods of use of our products are beyond our control. User must determine the suitability of our products and suggestions. PartsforSigns.com will not be responsible for claims beyond the replacement value of the defective product or in any way be responsible for consequential or incidental damages. PartsforSigns.com will not be responsible for order delays beyond our control. All sales at PartsforSigns.com are final. There are no refunds, credits, or returns allowed other then defective products that are covered under the warranty policy. Returned product must be returned to PartsforSigns.com within 7 days of receiving an authorized return number from customer service department. There will be a restocking fee applied to all non-defective, returned merchandise. Customer agrees to these policies in full. Orders placed before 12:00PM EST will likely be shipped the same day. 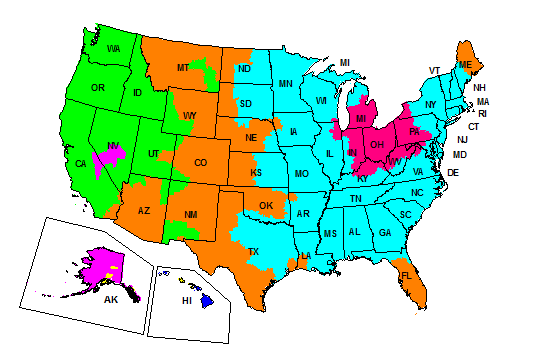 Transit times will vary based on shipping method selected and courier workload. We have decided to standardize all shipping and exclusively use Fed-Ex for all our deliveries and, as such, cannot deliver to P.O. boxes. View the transit time map below for an estimated delivery time for regular ground shipping to your location. **Please note** Saturday is not a FEDEX business day. Overnight orders placed on a Friday will not be delivered until Monday, the next FEDEX business day.